Islam is a religion of real life. It doesn’t isolate itself in the Masjid (mosque) or confine its teachings to religious rituals. It is rather a religion that coheres with people’s all aspects of life. Its divine guidance rules their behavior, their dealings, their relations, their sayings and even their thoughts. And because Islam is a social religion which is meant to organize and elevate people’s life, it undertakes providing treatments for all socially undesirable behaviours such as hatred, envy, gossip, spying and backbiting. Those social illnesses have destructive effects not only on communities but on human souls as well. In this article we try to analyze “backbiting” as one of those destructive social illnesses to find out its reasons, effects and treatment from an Islamic perspective. The Arabic term of backbiting is al-Gheebah or al-Gheebatu. It is defined as speaking ill of people behind their backs. To mention a Muslim in a manner which he/she dislikes is considered as a major sin in Islam that drives away from Allah’s mercy and leads to His severe punishment. 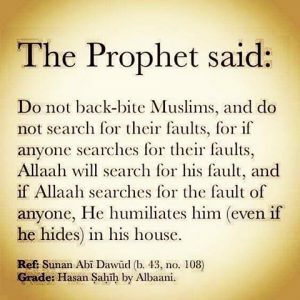 Why do people indulge in backbiting? I always ask myself why people find such repulsive behavior alluring and many cannot resist it. To understand this point we should always remember the Quranic fact that we are not alone in this life. Allah warns us continuously in Quran that we have a deadly lurking enemy which spares no effort to lead us astray all the time. The Shaytan‘s (devil’s) trick is to make backbiting tempting to our minds by provoking envy, hatred, disdain and mockery among Muslims. Some people deceive themselves and justify backbiting by coating it with showing pity and mercy for their victims, or even showing they do it out of anger for the sake of Allah. Human soul (Nafs) carries both factors of elevation and descent at the same time; if not trained regularly to be strong, pious and responsible, it becomes weak, fragile and ready to be deceived and manipulated by devils of Jinn and humans. Those of weak and deceived souls (Nafs) find it easier to speak ill about others instead of exerting effort to be aware of their own deficiencies and to work towards improving themselves. Allah (SWT) created man to be honored, and He imposed strict instructions aiming at preserving man’s dignity. Backbiting and gossip tarnish people’s reputation and kill their dignity. Moreover, it implants seeds of hatred and grudge among people. Therefore, it deprives them of living peacefully and being productive and creative. When communities are afflicted with such illnesses, it causes hatred and grudge to prevail. Then people fail to build strong relations, and teamwork becomes difficult and fruitless. Hence, the whole society will be in trouble. – When a person is wronged and he/she makes a formal complaint to a judge or someone responsible. – When a Muslim intends to change what is wrong and render the wrongdoer back to the right way by telling someone who has power on him/her. Avoiding backbiting, gossip and other major sins is a process of self- striving (Jihad al-Nafs) towards self-reform. A good Muslim should always keep in mind the serious consequences of indulging in such repulsive sins. The worst of those consequences can be losing reward (thawab) of all good deeds a Muslim does because all reward may go to the victims of backbiting in the Hereafter. There is nothing except repentance can rescue a Muslim from such consequences. Repentance should be accompanied by asking for forgiveness from victims of backbiting. If asking for their forgiveness will cause bigger harm, then praying for them, and praising them before people may expiate the sin. It is certain that reciting Quran regularly, adhering to piety, beneficial reading, developing human skills and being engaged in righteous deeds are basic steps in the process of self-reform. They are the best training to strengthen human soul and protect it from indulging in such major sins.